As a professional closed die forging company in China, we are equipped with seven closed die forging production lines for the requirements of different shape products, that is why we can customize closed die forgings for all the industry applications. In our forging workshop, forging equipment for each production line is different, currently, we have forging presses in 300t, 400t, 600t,1000t, 1250t, 1600t, 2500t. Forging presses with larger tons are used for closed die forgings in large shapes & dimensions. Also production steps may be varied from the shapes of products. For shaft type products, steps of closed die forging process are just five, that is cutting billets, heating by medium frequency furnace, drop forged by forging press, trimming by punching machine, last step is shot blasting. 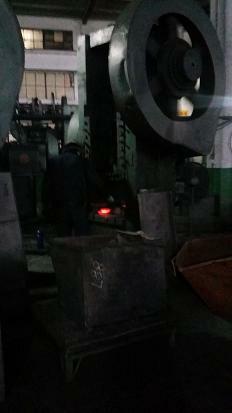 Thus, we will see a forged shaft product is finished, such shaft type product is the most simple way to make. For products in unshaft type without center holes, another step is added, after heating the billet, we will need to first press the heated bar into a oblate shape, so that it will be easily shaped by forging press, then put the oblate billet between the upper and lower dies to be pressed one time for desire shape, finally trimming. If there is hole in the center of product, then one more step will be needed, normally after trimming, we will see solid center of the products, then it will be placed in the punching machine to be pressed again so that the centre is hollow, so for unshaft type products with hole center, steps of closed die forging process is cutting billet, heating, press the billet to be oblate, forging, trimming, punching holes.